Step by step directions for Sautéed Brussel Sprouts seasoned simply with salt and pepper. Sautéed Brussel Sprout Recipe pan-fried in butter and olive oil is the perfect side dish and it doesn’t get any easier! A sprinkle of pomegranate arils brightens the flavors of this tasty dish! Did you guys know I’m the (self-proclaimed) Queen of Brussels sprouts? Tis true! If you look up How to Steam Brussels sprouts in google, little ole’ Bowl Me Over is on the first page in google, something I’m really proud of. I do like Brussels sprouts – pan-fried, steamed or roasted – never met one I didn’t like. And oooh! Don’t forget about pickled. Topping off a Whiskey Old Fashioned (sour of course) with a spear of pickled Brussels? YUM!!! 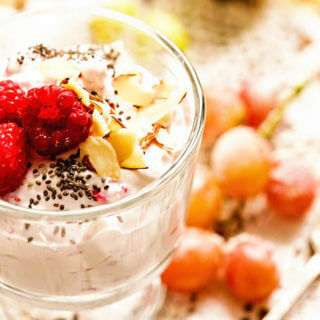 Say YES to healthy with this FREE Cheatsheet with recipes, meal pairings and more! How about you? 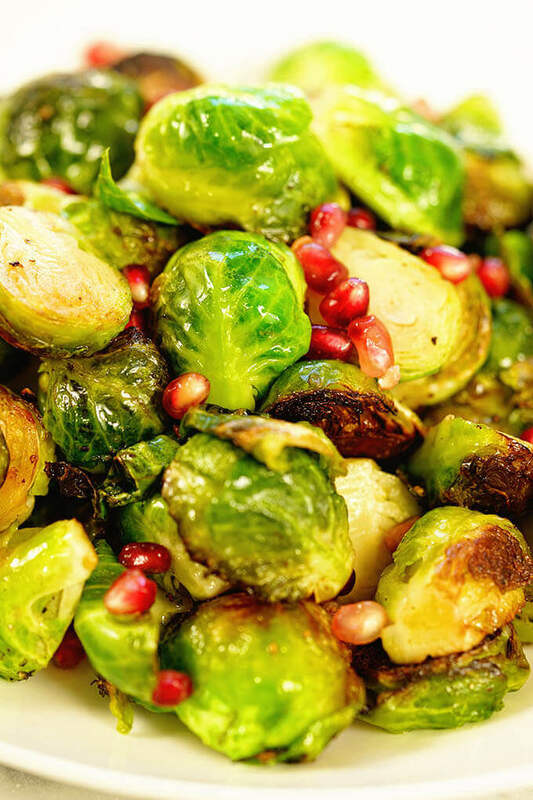 Sautéed Brussel sprouts – love ’em or hate? Your choice and there’s no wrong answer! Pan fried Brussels sprouts are an easy way to enjoy a great side dish! It only takes 10 minutes to cook so it’s quick and easy with simple ingredients. This sautéed brussel sprout recipe is very simple. You’ll start by cleaning them. I have step-by-step directions here to store and clean them, but let me walk through the basics with you. Rinse well under cool water. Trim the end of the sprouts and remove any brown leaves. Now they are ready to cook! Clean Brussels sprouts, trim ends and slice in half. Place a cast iron skillet over medium heat on the stovetop. Add butter and olive oil. Next, add the sliced brussel sprouts. Flip them over so the cut side is flat on the bottom of the pan. Saute uncovered. Do not stir, allow to cook for five minutes. Give a good stir, allow to cook for another 2-3 minutes. Using a fork, check to see if they are tender. If not, cook for another couple of minutes. How do you caramelize brussel sprouts? The key to caramelizing Brussels sprouts in butter and olive is allowing them to cook and sauté undisturbed. 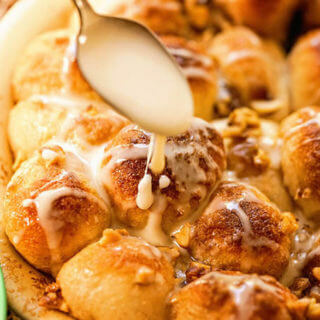 Don’t stir or push them around the pan. Allow them to roast. If you stir them around too much, they will steam as opposed to caramelize. Seasoning the brussel sprouts simply with salt and pepper enhances their flavor! One more thing – see that dark brown caramelization in the picture above. 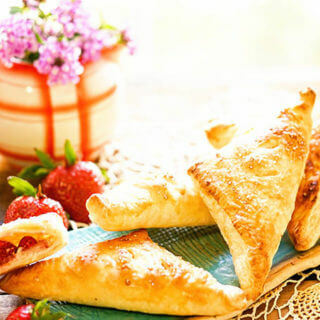 How the edges are brown and crispy? That’s what gives them flavor! 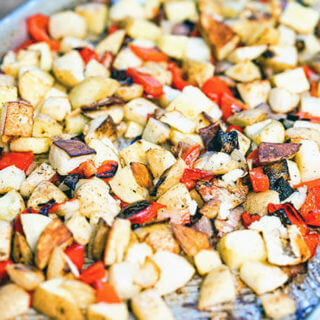 When it comes to sautéing, brown food tastes good and the best way to get that is patience. Allow your pan and the ingredients to do the work for you! How do you know if brussel sprouts are bad? When you choose Brussels at the grocery store, look for bright green colors, including the stem. If the stem is brown or dark, discard it. They will be best if you use them within the first couple of days of bringing them home. You’ll know brussel sprouts are bad if they have a strong odor prior to cooking. If that’s the case just discard them. First, clean the Brussels sprouts by rinsing them in cold water. Remove any outer leaves that are brown and snip off the end. Get my FREE Conversion Chart NOW!!! 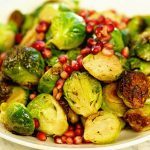 Looking for more tasty Brussel Sprout Recipes? Here are some of my favorites! 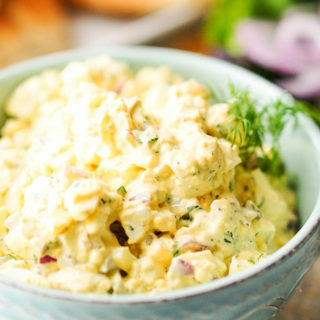 A few more of my favorite vegetable side dishes! Sautéed Brussel Sprout Recipe cooked in butter and olive oil seasoned simply with salt and pepper! A sprinkle of pomegranate arils brightens the flavors of this side dish! 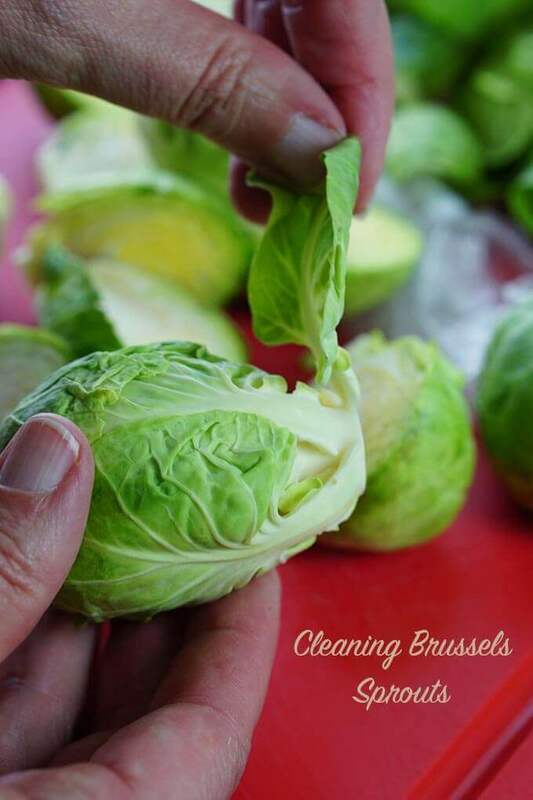 Run the Brussels sprouts under cold water to clean them well. Trim the ends and remove any brown leaves and discard. Slice them in half. 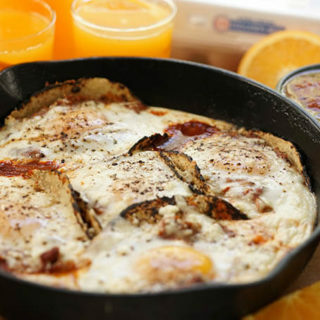 Place a cast iron skillet over medium heat on the stovetop. Add the butter and olive oil, heat until hot and bubbly. Next add the sliced brussel sprouts. Flip them over so the cut side is flat on the bottom of the pan.Saute uncovered and undisturbed for 5 minutes. Do not stir, allow to cook and caramelize. Give a good stir, allow to cook for another 2-3 minutes, again let it cook and caramelize. Using a fork, check to see if they are tender. If not cook for another couple of minutes. When tender remove and spoon into a serving dish. Top with pomegranate arils. I love Brussels in general, but these are so much better than anything else because of the pomegranate flavor! What a great idea! Totally love brussel sprouts and the addition of pomegranates are going to take this over the top! Brussels are so tasty! I hope you give this a try! I would have never thought to add pomegranate! This flavor combo sounds to die for! The moms just bright the sauté, these Brussels are so tasty!! I love your idea of adding in pomegranates!! Can’t wait to try this with supper tonight!! If you’re a fan of Brussels you’ll love these!! I don’t know if I have ever made Brussel sprouts! But I totally want to try now! 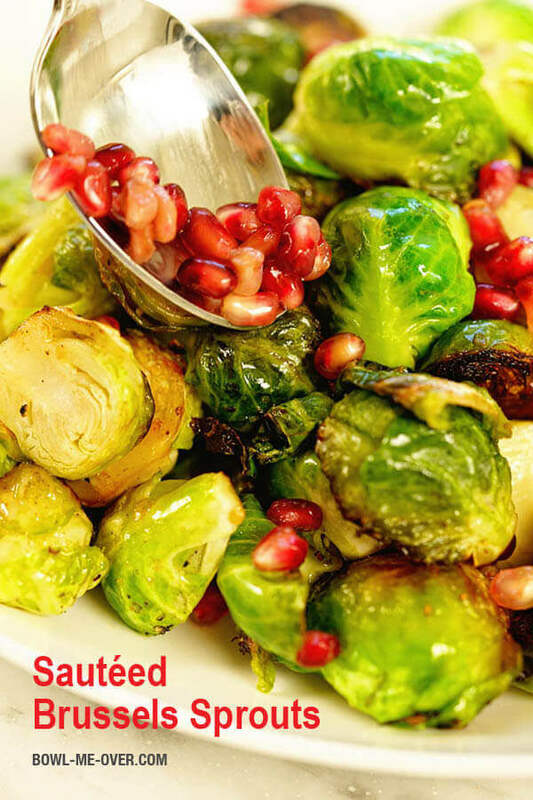 Adding the pomegranates gives brussel sprouts the perfect flavor boost. Yes, that bright pop of flavor! So tasty!